A hui hou! 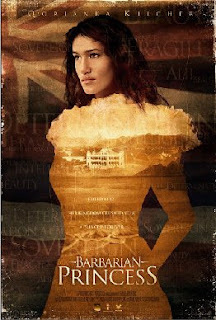 : "Barbarian Princess"
From its controversial titles to its non-Hawaiian star to its use of Iolani Palace, the $9 million Princess Ka'iulani film that's being produced by Matador Pictures and Trailblazer Films and is currently shooting on Oahu is causing a big stir among Native Hawaiians, state senators, and others. Let's start with the title controversy: originally entitled "Barbarian Princess" (ironically so, since this was how the San Francisco Chronicle referred to the princess back in the day), the title was changed to "The Last Princess" to appease those who found the former title offensive (for obvious reasons). However, this new title is now an issue because Ka'iulani was not in fact the last princess--that designation, some say, belongs to the still-living royal descendant Abigail Kawananakoa.